Cancellation policy: 7 days before chechin. We will charge credit card guests in case of no show or cancellation less than 7 days before the checkin. L'Hostel a Casablanca is very well located in the beautiful and peaceful area of l'Oasis , close to the train station l'Oasis , the hub for those who come/go from/to the Mohamed V airport, from/to Marrakech. 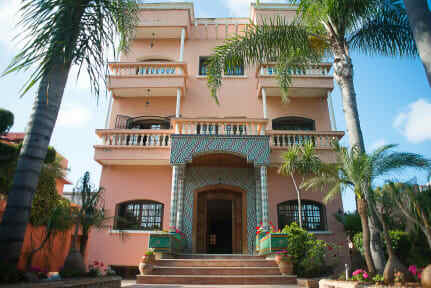 Hosted in a superb Moroccan Villa L'Hostel a Casablanca is midway from Guest House to Hostel, with a beautiful garden, a wide terrace and comfortable amenities. We aim at creating a friendly community. holding ourselves to high standards of cleanliness and having designed our space to meet a wide range of travel-related needs. Once you open the gate, you will actually feel at home: comfortable bed, towels and linens, daily cleaning service, WiFi, large common areas where to relax, socialise, watch TV, plus a beautiful garden and an amazing terrace with it’s barbecue. L'Hostel a Casablanca features different spaces. You can relax in our two wide living rooms, meet other travellers in the garden, work or read at comfortable tables. Throughout L'Hostel , even in the garden, you can make use of our fast and secure WI-FI connection. All L'Hostel guests are welcome to 24/7 complimentary bottled water. A breakfast buffet is provided, as well as access to a micro wave and a boiler. L'Hostel has a 24-hour front desk. Check in time at 15.00 and check out time at 12.00. If you are coming from the airport early morning, you can drop your luggage and come back later after a short visit in the City. If you are going to the airport to fly back in the evening, leave us your luggage, visit the City and come back later to collect your luggage. Remember, we are 10 min away from the Gare L'Oasis where you will take the train to the Mohamed V airport or to Marrakesh. 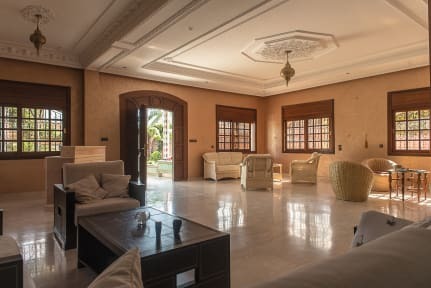 Whether you are visiting Casablanca for business or pleasure, L'Hostel location makes it easy to explore the city and enjoy a large number of attractions. We are situated in the residential area L'Oasis, minutes away from the train station l'Oasis, from the tramway station Bachkou, from the market Oasis. While you can enjoy a peaceful atmosphere within our area, most interesting places can be reached within 15-20 minutes either by taxi or by tramway. If you are visiting Casablanca even just for a day -on your way to Marrakech or Chefchaouen-, we will help you make the most of your time. Many of our guests are digital nomads and business professionals. Together we aim at creating a fun, friendly, welcoming community. If you are coming on a business trip, L'Hostel is the right place for you. 4 tramway stations from Technopark, 15 min from the administrative centre of Casablanca with the CRI- centre for investment - the main business centre in Casablanca. 25 min drive to Casa Nearshore. Our dorm has been designed to give our guests a real comfort for a price far less than in hotels. Privacy curtains, built-in lockers, a reading light and towel, provide a cosy personal space. The shared bathrooms come with make-up mirrors, free toiletries, and hairdryers. Our private rooms are equipped with cupboards, table and chairs, some with air-conditioning, others with fan. The Dorm, the Fuchsia bedroom and the Rose bedroom are situated at the bottom level, where you find the restaurant and the terrace. They share the same bathroom.The Corail and Blue bedrooms are situated at the first level. They share a big balcony and a bathroom.The Yellow bedroom is situated at the 2nd floor. It has a private bathroom.The Casablanca Suite is situated at the 2nd floor. It comes with 2 rooms, 3 beds (1 double 2 singles) an en suite bathroom, dressing, air conditioning, 2 balconies with view on the garden.